Internet system, I.E., it comes from the distributed cache system. 1. 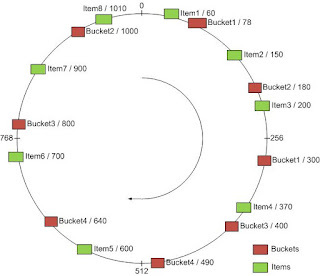 Items and buckets are all hashed(normal hash) into some integer interval (for example: [0, 1024]). 2. Item is mapped to a bucket that is closet to it. 3. 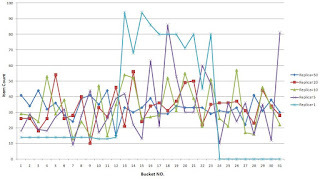 Bucket may be replicated to improve even distribution balance. You can see that only Items on Bucket3 are changed, and they are distributed among the remaining buckets. changed, and the new bucket gets load from the original 4 Buckets. particular bucket won't be very large (the so called Spread/Load property). A C++ version of consistent hashing function can be found here, it uses STL map as the binary search tree. You can see that as the replica count increases, the item distribution over buckets will become more and more even.